In his fourth consecutive acting job with the comedy trio, Emil found himself working yet again with the Three Stooges. Although his role in VAGABOND LOAFERS (1949) as "Mr. Norfleet" was a nice two-day job, his characters in PUNCHY COWPUNCHERS (1950) and HUGS AND MUGS (1950) were little more than bit parts, with each appearing in only a few scenes. 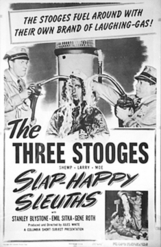 In SLAPHAPPY SLEUTHS, Emil had another good, relatively substantial role, engaging in plenty of gags and exchanging numerous lines with the Stooges, and it earned him both screen credit and his name on the movie poster. Oddly enough, Emil's character in SLAPHAPPY SLEUTHS is named "Emil" and is described as a "stooge." 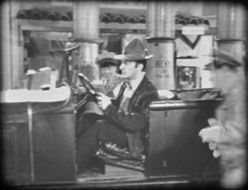 Script writer Felix Adler, who had written comedy routines for Mack Sennett and Hal Roach before joining Columbia Pictures, no doubt created Emil's role specifically for him. Emil liked Adler and once remarked, "Most of the comedy writers were reserved, laid-back types who rarely cracked a smile, but not Felix. He was always cheerful, always laughing. Sometimes when he was describing a gag sequence, he'd start laughing as he was telling it to you." 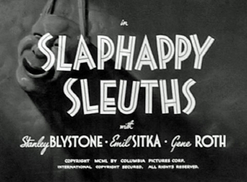 SLAPHAPPY SLEUTHS was produced and directed by Jules White, and the cast includes Stanley Blystone, Gene Roth, Nanette Bordeaux, Joe Palma and Blackie Whiteford. 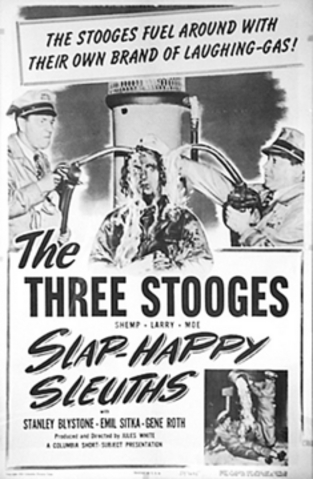 In the story, members of a gang have been robbing gas stations, so detectives Moe, Larry and Shemp go undercover as service station attendants in an effort to capture the thieves. 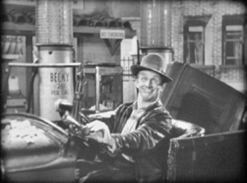 In a slapstick sequence running just over four minutes, Emil drives in to the Stooges' gas station as their first customer, and they're determined to give him extra special service. As he pulls his old car to a stop, Larry rushes in from one side and begins giving Emil a manicure. Shemp rushes in from the other side and starts polishing Emil's shoes, and Moe comes up from behind, removes Emil's hat and combs his hair. 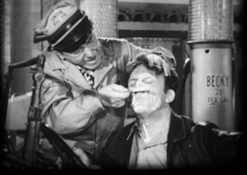 Emil, who hasn't said a word so far, seems to be enjoying the attention until Shemp applies boot polish to his leg, Larry bites a hangnail off his finger, and Moe gives him a fast shave with a dull blade. Finally, after the manicure, shoeshine and shave, the Stooges ask Emil, "So what'll you have?" Back in those days, premium grade fuel was called "ethyl," which sounds the same as "Ethel," a common woman's name. So the Stooges have their gas pumps labeled "Ethel," "Becky," and "Hazel." Emil replies to the Stooges and says, "I'll take five gallons of Becky." Larry tells him, "We're all out of Becky. How about some Hazel?" Emil snaps back, "I don't like Hazel. I'll be back tomorrow for Becky." These scenes are another good example of how a final film can deviate from the original story. A reading of the script reveals that all the crazy antics with the razor and the nail file and the shoe polish, as well as the Becky/Hazel bit, occur between scenes 21 and 22. Yet there's no mention of any of this action in the written script. (See the Image Gallery below.) 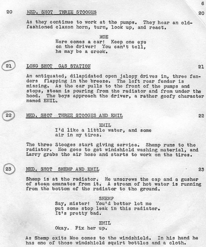 All this material was added by either the director, the Stooges, or the writer, after the final draft was printed. 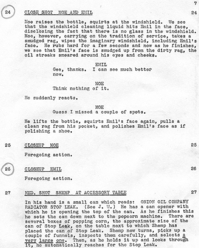 In contrast, a writer will often go into great detail with a gag, as for example in scene 24 where the script describes Moe cleaning the "imaginary windshield," spraying Emil's face, and then wiping him with a dirty rag. In this case, the script and the final film are the same, right down to the "oil streaks smeared around his eyes and cheeks." In scene 22, Emil, varying his lines slightly, tells the Stooges to, "Put some water in the radiator and some air in the tires." Shemp then informs Emil his radiator is leaking and suggests filling it with stop-leak. 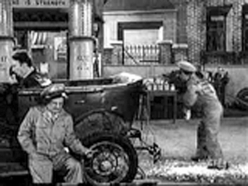 Emil agrees, but Shemp mistakenly fills the radiator with popcorn instead of stop-leak pellets. Soon popcorn shoots from the radiator and everyone stops to make a snack of it. When Shemp stops up the flow of popcorn by screwing the radiator cap on, the popped kernels start streaming out of the exhaust pipes, where Larry starts catching and eating them. Moe comes over and pushes Larry aside so he can get some popcorn too, but the flow stops. Peering closely into the exhaust pipes, Moe raps them with a wrench. Suddenly a big blast of black soot powder shoots straight into Moe's face. When he looks up all you can see are his two white eyes surrounded by black soot. Larry looks at him and says, "Hey, why don't you sing Mammy?" Near the end of his scenes, when Emil starts his car to leave, there's an explosion in the motor and the hood flies up into the air. When it comes down, it lands on Emil's head and knocks him senseless. With a silly grin on his face, he shifts the car into gear, honks the horn, and drives off in a stupor. In an interview years later, Emil said that the director, Jules White, uncharacteristically gave him only vague instructions on how to enact his role. White usually showed his actors exactly how he wanted a role performed, but this time White simply told Emil, "Now, just let the Boys do their act. Don't react too much to it or do anything. Just let them do their stuff to you." That explains Emil's subdued and tolerant disposition while receiving the Stooges' "extra special service." During the making of this film a big blunder happened. When the pop-corn stops coming out of the exhaust pipe for Larry, Shemp comes to check & pushes Larry out to look into the pipe - and gets doused with black exhaust powder in the face. A good take, and funny too. But to Jules White it was not. He ordered a re-take -- and Shemp was mad as hell. Cussing all the way to his dressing room. Why? The wrong Stooge! It was supposed to be Moe -- not Shemp. So to the chagrin of both Shemp & Moe it was re-shot with Moe.